Brunswick corporation announced that is has completed the sale of two yacht brands, Hatteras motor yachts and Cabo sportfishing convertible yachts, to Navis HYC Acquisition, an affiliate of the Philadelphia, Pennsylvania-based Versa Capital. We reported in January that Brunswick Corporation had put Hatteras Yachts and Cabo, both based in New Bern, North Carolina, up for sale. Brunswick had purchased Hatteras in 2001 and Cabo in 2006. Lazard Middle Market acted as the sole investment banker for Brunswick in this transaction, for which details have not been disclosed. However, both builders are expected to remain in North Carolina with current Hatteras and Cabo President and CEO John Ward staying on board. 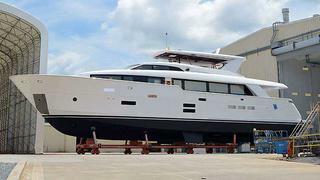 Hatteras is set to launch its new flagship, the first Hatteras 100 RPH, which is scheduled to debut at the Fort Lauderdale International Boat Show this fall.